Having had over 7 years of formal music education, I still have a great affinity for making music despite having quite playing the piano over 10 years ago. New music-making software is making composing music both easy and fun on your computer. Now there’s a way to make music from the comfort of your Android phone! 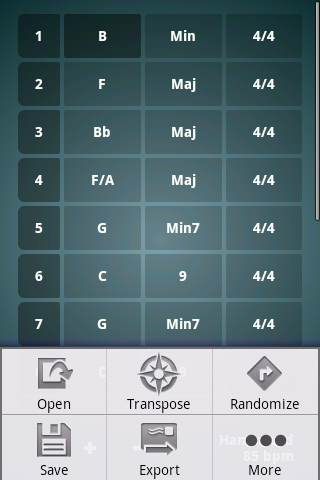 Chordbot Pro allows you to create amazing songs using chord progressions. Find out what it’s all about in today’s musical test report. It seems like anybody can be musician these days even if you don’t have an instrument. Mixing, editing and creating music is all possible from just about any computer. Instead of playing on their guitars in the subway, the new generations of up and coming musicians are sitting in cafés and restaurants around New York City composing music from their laptops. Some may see this as the end of music, while others relish the new technology available to produce music with little experience and/or money. Although most music is still being made on laptops, there are a few apps that are making the transition over to smartphones. Chordbot Pro allows you to compose music on the go by arranging chords in any order to create interesting sound experiments. Let’s say you’ve come up with a tune in your head on your daily commute to work. With the help of Chordbot you can enter in the chords and hear what it sounds like with different instruments. Pretty amazing, right? 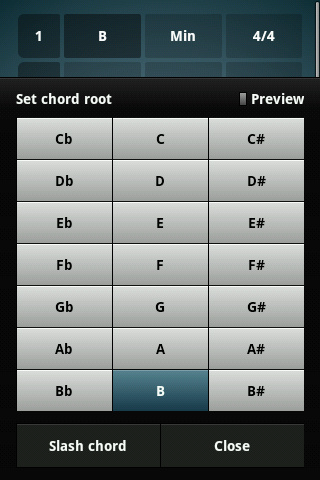 To get started you first select a chord root (i.e. your base note CDEFGAB etc.) This list includes all notes with both sharps and flats. 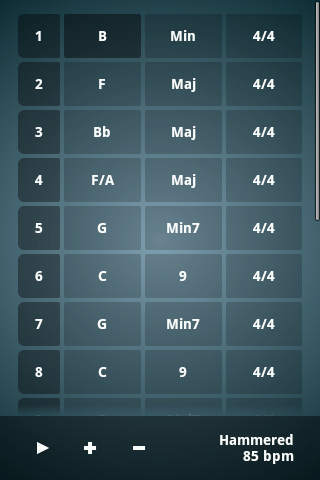 After that you can select the chord type from an all-inclusive list (major, minor, augmented, diminished etc.) Finally, you can choose an appropriate time duration for your chord (2/2, 2/4, 6/4 and so on). Chordbot Pro includes 30+ styles, but the lite version gives you a fairly good impression of what to expect. Last but not least, you can also adjust the tempo to speed up or slow down your composition. The tempo is measured in beats per meter just like your regular metronome. By pressing the Preview button, you can get an idea of what each setting will sound like before you commit to a change. If the tempos available aren’t enough, you can create your custom bpm (anywhere between 40 and 400). Making tunes with Chordbot is sort of like adding layers to a cake. For those of you more familiar with music theory, it’s also possible to transpose your chord progression by changing the pitch (or semitone) of all the chords in your composition. Chordbot also comes with a couple of preloaded songs that you can play to get some inspiration for your own compositions. In the full-version of the game, you can save your work to the SD card and export your compositions as a wav or midi file. 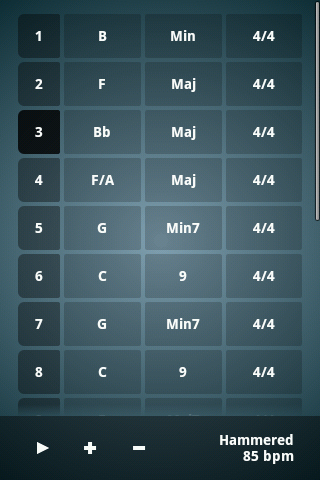 Chordbot is a great app for wannabe composers or for those of you looking to record chord progressions on the fly. With just a pair of headphones, you could be composing the next hit song while riding the subway to your day job. I would highly recommend this app for anyone interested in music and looking for a fun and easy way to compose simple yet creative tunes. Another great thing about the app is the sound quality: it’s not the usual crappy sounding MIDI. Your phone sounds like an actual synthesizer! Chordbot Pro is very easy to use. 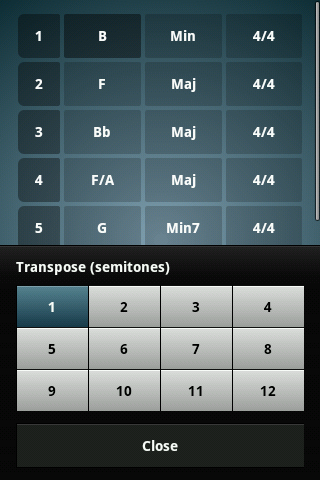 Just tap on the chords to change the root, chord type, tempo etc. Each chord is numbered starting with 1. Press the + and – symbols at the bottom of the screen to add/delete chords to your composition. Just tap the Play icon to listen to what your chord progression sounds like. There aren’t any fancy graphics, but everything is beautifully laid out and very easy to navigate. Export (export and/or email your composition). Didn't experience any glitches or lags with the program. Chordbot Pro played all the sounds perfectly without any delay or distortion. Chordbot Pro is available for ~$6.16 from the AndroidPIT App Center. The full-version gives you access to all instrument and lets you export and save your compositions. There is also a demo version called Chordbot Lite offering a limited selection of instruments and lacking a save/export feature. Getting the full-version is a must for people interested in saving and sharing their music with others. It's a pretty steep price, but I think it's worth it for real music fanatics like myself.